It seems like we've entered a new era of mobile phone charging with Meteor this week. 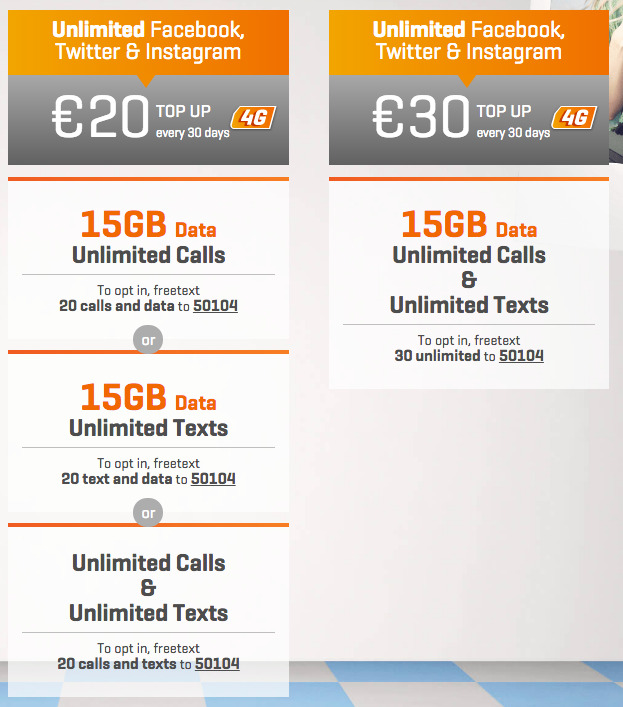 On Meteor's 4G plans now, you do not pay a cent for access to Facebook, Instagram, and Twitter on your mobile device. Completely Free Access To Your Favourite Social Media Apps. In fairness to Meteor, that sounds pretty amazing. Given that you can rack up a huge bill while you update your status and let people know about your latest workout (who does that? :) ), Meteor are throwing a bone to the heavy snappers and chatters. As an example, 1 hour a day of Twitter or Facebook can rack up a hefty 1.5 GB of data use per month, and Instagram is even more photo-intensive. As more and more of these apps also focus on video - you're going to see your data dials hit the roof! An hour of video a day could push you to 3.5 GB extra per month! Known as "zero-rating", giving free access to certain applications or websites is becoming more common around the world. For some time, the 48months network in Ireland has offered this for some time with Whatsapp traffic, but Meteor is the first big name to launch tariffs with zero rating for the masses. Zero-rating is a controversial topic - while its good for consumers, and brings down bills, it opens up a huge slew of questions with regards to net neutrality - "the principal that internet service providers (e.g. Meteor) should enable access to all content and applications regardless of the source, and without favouring or blocking particular products or websites". Net-neutrality campaigners highlight that moves like this bring us closer to an internet where people are restricted access to certain services or offerings. e.g. Pay $5 extra for youtube.com. This is not a situation that no one will be grateful for. No doubt that Meteor's new offers will bring these arguments to the fore in Ireland. The argument for zero-rating is the benefit to consumers (in the short term anyway), so Irish consumers will be sure to enjoy snapping, tweeting, and Facebooking to their hearts content on the Meteor network. With some great tariff prices for SIMO and prepay customers, and already offering free EU roaming for those on Billpay plans - Meteor might be onto a winner for some new customers. Take a look especially closely at the SIm-Only Regular Extra Plan for €24 per month if you're a pay-monthly person, and a quick look at the €20-top-up options if you're on pay-as-you-go. With 15GB of 4g data on prepay, that's excellent value. Meteor are definitely worth a look. They've made some big investments in their network over recent years, and some of their recent tariff innovations have represented excellent value. These new additions may sweeten the deal for customers, but overall, the issues that zero-rating may eventually bring to the internet may not be worth the short-term gains. Tread carefully! As we always recommend - know your usage before you pick the plan you want and don't commit to a 2 year plan unless you're sure you're getting good value and enough allowances to cover you! Try the KillBiller app for a look at how much you'll spend.